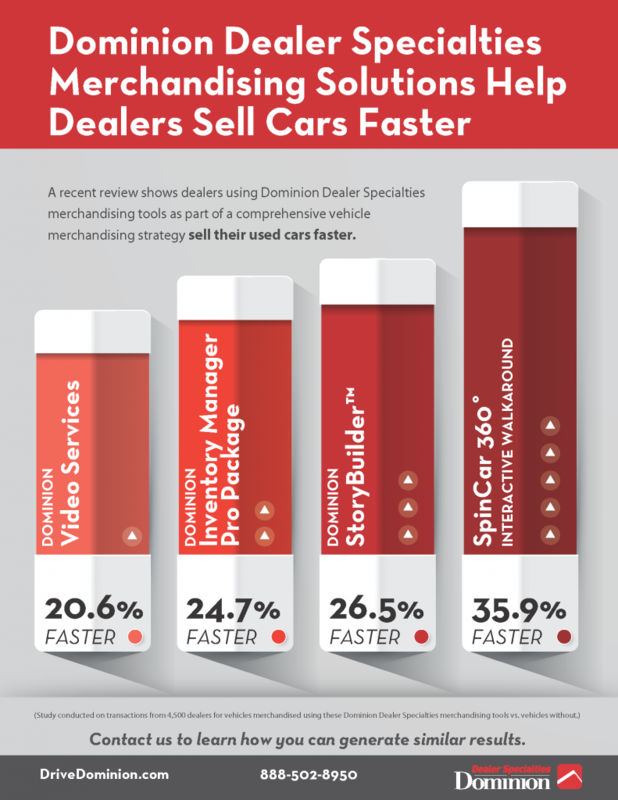 We found that the following Dominion Dealer Specialties merchandising tools help dealers significantly reduce the number of days that it takes to sell a vehicle. Video is the best format to drive car shopper consideration and increase search engine traffic. Live video creates a virtual test drive; engaging car shoppers with a full-motion review of each vehicle. Using a proven strategy, Dominion Dealer Specialties’ Lot Service Specialists capture, process, brand and distribute captivating unique vehicle videos that sell cars faster. Dominion Inventory Manager Pro Package delivers best-in-class inventory merchandising to drive faster inventory turn. Industry-leading inventory management and market-based analytics ensure that dealers deliver the best price and merchandising for every vehicle. Unique, VIN-specific stories make your vehicles stand out and ignite an emotional connection with your customers. Dominion StoryBuilder automatically generates unique and compelling vehicle comments. By instantly transforming vehicle-specific data into engaging stories, dealerships draw in potential car buyers online and sell vehicles faster. Consumers love interactive content. The SpinCar 360° Walkaround™ tool lets car shoppers interact with your dealership’s new and used vehicles. Users can rotate cars to view a complete walkaround or click on hotspots to reveal more information about specific vehicle details. This engaged interaction turns available inventory faster.